This Thai recipe will make you say yummy..Sauce is not sweet not sour but with pineapple chunks it feels you are in heaven. For vegetables. Boil 3-4 cups of water and add salt. 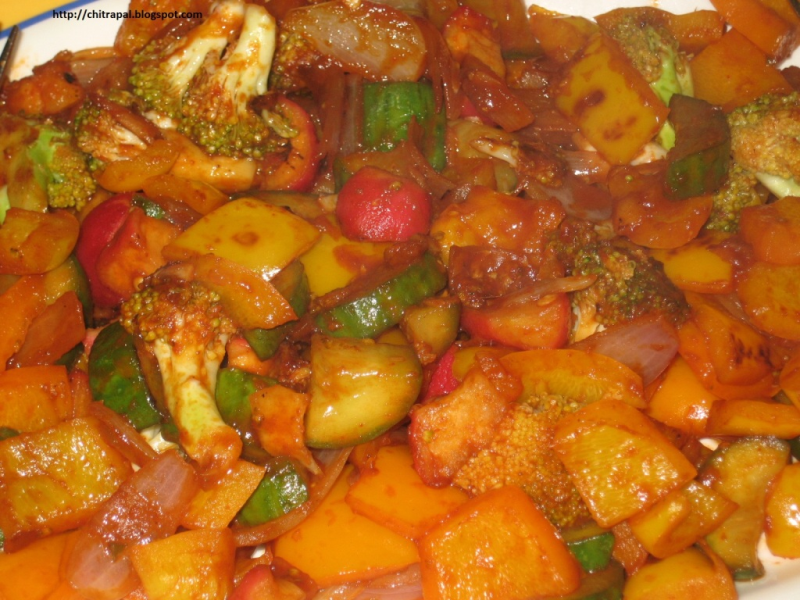 Drop in all vegetables except water chestnuts to take the edge off but still being crunchy just for 3-4 minutes. Take out the veggies and scatter them in an open tray to cool them quickly. In the mean time add sesame oil, soy sauce, vinegar, honey and corn starch water in a small bowl. Whisk and heat the mixture till sauce turns little thick. Heat oil in a non stick wok (khadiy) or deep dish pan. When the mixture little pink add all cooled down vegetables in the wok add water chestnuts now. Keep on stirring in between. Fry them little brown and then add soy sauce mixture and stir with tongs. When it is incorporated add pineapple juice with chunks and stir. Let it simmer for sometime till it turns little thick sauce. Plate them and garnish with chopped green onions. You can serve with steamed rice.